This recording will help to prepare you for when and if you are faced with litigation. Explore the legal and ethical considerations for the treatment of minor populations in Indiana with regard to age of consent, confidentiality and custody concerns. 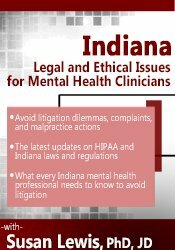 Analyze the limits of confidentiality as it relates to duty to warn law in Indiana. This self-study course includes 6.0 hours of state specific ethics instruction. Not all boards allow ethics credit for self-study products. If ethics is not specified within your licensing board’s approval statement below, please contact your board to determine the applicability and amount of ethics allowed. Nurses completing these self-study materials will earn 6.3 contact hours. Expires: 1/10/2022. PESI, Inc. designates this self-study activity for a maximum of 6.0 AMA PRA Category 1 Credit(s)™. This activity was originally recorded on 1/10/2019. It was last reviewed on 12/6/2018 and is valid until 12/6/2021.